This stage adds a Workflow member to a GatorMail group at the point in which it's used. 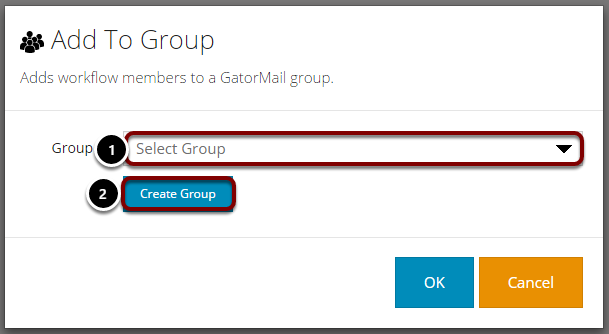 It can be used when an email has been sent to a group, and certain members don't meet the group criteria. So you can add them into a new group for those who have not met the criteria. On dragging this stage to the canvas you are able to select a group from the list or create a new one at this point. Click 'Create Group' This will allow you to create a new, blank group to add members to.